Suicide rescue - Brink of Death on the Brink of Niagara's Horseshoe Falls (Canadian Falls) on the American side next to Goat Island - the rescuers are the daredevil heros. 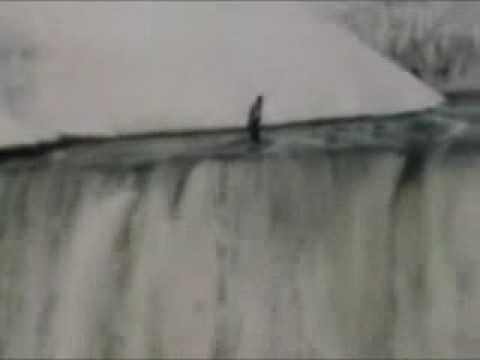 This is actual footage captured by tourists and amateur photographers on 19 March 2003, of a 48 yo man from Buffalo, NY, at the brink of Niagara's Horseshoe Falls along Terrapin Point of Goat Island, NY. Earlier that day he lost thousands (borrowed from his father) at newly opened Seneca Nation casino, and was already $600,000 in debt to Casino Niagara in Canada. He was overcome with despair, and left a carefully written note behind saying, "Please tell my parents I'm sorry." The shock of the cold water and swift current jolted him to realize he wasn't ready to die - commonly said by survivors of dramatic suicide attempts, i.e., at the Golden Gate Bridge. At the very last moment before the falls brink, he wedged his feet in a crevice and held on for hours before rescue. How was he able to stand there or stop his body from advancing to the edge? Rapids above the falls reach a speed of 25 mph / 40 kph. The bottom is jagged and worn slippery smooth (walk on the rocks at three sisters' islands to see how slippery, even when dry). The water at the spot where the man stood was thigh high. At night and in winter 75% of the water is diverted for power (in summer daytime 50% is diverted). At 5:00pm in Summer there is twice as much water, deeper and more violent. How he withstood the water pressure, even reduced, on slick rocks, even jammed in a crack, in ice cold winter temperatures is hard to fathom. Rescuers approached from an ice shelf jutting over the water. Hightly decorated helicopter pilot, Capt. Kevin Caffery, was known for taking extreme measures to save people in many river and lake rescues (aka, ice fishermen stranded on a breakaway ice flow, landing on a submerged rock to save a woman). Here, Caffery pushed the limits of the single engine helicopter in blinding mist and unpredictably updrafts from the releasing energy of the falling water. In the water were police Sgt. Pat Moriarty and firefighter Gary Carella. They strained against the current to save him from drowning when he was pulled under the ice shelf by the water. He said to his rescuers, "Let me go, don't kill yourselves, too." He said over and over, "I'm sorry." They managed to pull him to safety. He was admitted to hospital for his injuries and psychiatric help. He refused reporters interview requests. The tape of his rescue is used for training. Stunters are finned and charged for their rescue. Depression and other illnesses which induce suicide are not illegal and not fined. Through a contact, I was told that the rescued man continues to get support (GA) for his gambling addiction. This event was reported by many local and national news outlets: AP, CBS, Time Magazine, and others. The man's name was not released. Niagara Falls is a very beautiful place on earth. The power and the magesty of the Falls is overwhelming. You can get up close and personal with the Falls in many safe ways. The Maid of the Mist (US and Canada), the Cave of the Winds (US), and Journey Behind the Falls (Canada) are amazing. Unfortunately, some people go there for other reasons. Every year there is an average of 12 to 18 known suicides at Niagara Falls (not all bodies are recovered) and about 25 a year at the Golden Gate Bridge. Awareness, proper help and the support of friends and loved ones could prevent a vast number of these deaths. The lure of the Falls for suicide is well documented, but in recent years, the publicity is presumed to inspire more people to choose the Falls as a means to their end. It begs the question, why more isn't done to curb suicide at it's source, and to offer more mental health services - this queston was raised after the college shooting and suicide in VA.
At the Falls, many people, both men and women, have gone into the rapids quietly, calmly, and often without witnesses. Due to the rocks at the bottom of the American (Rainbow) Falls, there is a lure to the expectation of a quick finality and a hope that their body won't be found - although many are pushed out by the force of the water. Often the only facts of the suicide are notes, letters, personal belongings, and clothes left behind. Over the past 100 years, several people were rescued from the water or rapids between Goat Island and Prospect Point. Usually they were within 100 feet of the shore and 100 to 500 feet from the edge of the Falls. Police, firefighters and friends, used a combination of rope, ladders and wading into the less rough part of the water to get within rescue reach. In recent years, there were several daring rescues, using police and tourist helicopters, from areas not safely accessed any other way.